If you have more than one cat, feedings can get rather interesting. You might even say it feels like… herding cats (*ba dum tsss*). Some cats need to eat more, some less. Some might have a special diet. Some might be grazers, while others like to hoover their food up all at once. Regardless of your particular combination of kitty eating needs or styles, it’s important to know how to approach meal time with multiple cats so that every cat gets enough to eat, but not too much; and eats what they’re supposed to eat, but not what they’re not. If you’ve ever had to juggle different types of foods or quantities of food for multiple cats, you’ve probably felt the stress that comes with it. Good news though! You’re not alone, and the trials and tribulations we here at Preventive Vet, as well as other cat owners, have endured means that we’ve got some good tips and even different feeding and “feeder” options that can help you de-complicate your multi-kitty meal time. Won’t that be nice! These feeders are great if you’ve got to keep one of your cats away from a certain food… say, a cat with a diagnosed food allergy. You can also get a separate feeder for each cat to make sure they only have access to their specific food — both the type and amount. Just program the feeders to open for the microchip or RFID tag that the cat is wearing. 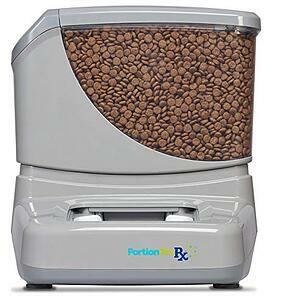 PortionPro Rx — This veterinarian-developed smart feeding system has some great features and attributes that make it a fantastic solution to the problem of feeding individual pets in multi-pet households. To start with, you can program the feeder to either be in default "open" mode, or default "closed" mode. If it's in default "open," the door is always open and any unapproved pets (tags) that come near will trigger the door to close so that those unapproved pets cannot steal food from the feeder. The door will open again once the unapproved pets walk away. In default "closed" mode, the door is closed all the time until an approved pet comes near, and closes again when they walk away. Since the inventor of the PortionPro Rx is a veterinarian, the company went so far as to undertake a study to see if their feeder could help overweight cats in multi-pet homes achieve important weight loss. The study was conducted in 100 homes, and in fact 90% of the pets achieved desired weight loss! That's great news! This feeder option is a fair bit more spendy than the option above, but then obesity and the secondary complications that can arise from it (like diabetes, chronic skin problems, and more painful arthritis) aren't exactly cheap. Meowspace Feeder — This fully enclosed and secure feeding space is controlled by your pet's microchip, so no additional tags or other tools are needed. Just program the feeder to unlock only when a particular pet is around. Have multiple pets you'd want to have access to this enclosure—like if you're using it to keep the litter box away from the family dog (or toddler)? Just program the unit to unlock for each of your cat's microchips. Easy! Pets not microchipped? No problem! At least as far as the Meowspace is concerned, because you can purchase their special magnetic collars that will also unlock the door to allow access. (Note: While the Meowspace doesn't have a problem if your pets aren't microchipped, you and your pets may! Microchips are a great and permanent form of identification for pets and they 100% help to reunite lost pets faster and thus help save lives! Please, talk to your vet about having your pets microchipped, if they aren't already.) The Meowspace is nice because it's fully enclosed and may provide your cat the comfort and security of not being attacked or bullied while they're eating. Of course, some cats may feel threatened and stressed even if another pet (or toddler) is staring at them while they're in there, and some cats may be reluctant to enter such an enclosed and confined space for fear that it might be difficult for them to get out if another pet is blocking their exit or laying in wait for them. You might also have a cat that eats faster than the others and makes a habit of sneaking over and muscling other cats out of their food. One easy trick is to slow down their eating speed so everyone finishes at about the same time. 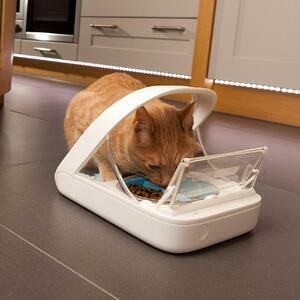 Try one of these interactive feeders for slowing down your food gobbling cat. “Smart feeders” and food puzzles can come in handy and help in many situations, but sometimes they’re not affordable or don’t quite do enough to solve the problem you’re dealing with. Thankfully there are a few “low-tech” tricks you can try to keep your kitties eating only what (and how much) they should. Place one food bowl up high: Got a less sprightly, overweight, or arthritic cat that needs to be on a diet, or a specific weight loss or joint support food to help with their condition? Try putting the other cats’ food on a counter, shelf, or other elevated surface. This will allow more-agile cats to get at their food, while restricting your overweight or arthritic cat to their own food down on ground level. Feed separately: If placing one food dish up high isn’t an option, or won’t work, you can feed each cat in a separate, closed room. You can also feed each cat in his or her own cat carrier (which can also help them learn to love their carrier— as you’re associating it with something great and fun… food). Or you can try dividing your main “feeding room” with a baby gate or other barrier during meals. These “feed separately” options are (along with feeding from one of the food puzzles linked above) often the easiest and most effective ways to deal with a “food bully” or food aggressive cat in a multi-cat household. 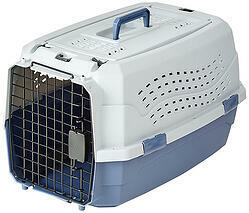 Here are a few great cat carrier and baby gate options if you don’t have multiple rooms to spare. Stand guard: It’s not ideal, but it works. If you don’t have the option to easily feed your cats separately, you can still keep their food bowls as far apart as possible, and take a seat somewhere nearby where you can watch and calmly interfere (don’t punish) if one cat is going to steal from the other. Of course, you’ll have to do meal feeding (as opposed to “free feeding” or “grazing”) for this to be effective. Thankfully, I usually recommend meal feeding for cats anyway – see why you should think twice about letting your cat free-feed. 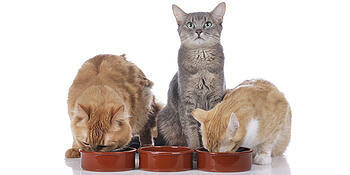 Feeding multiple cats different diets (or amounts) can be trying and tricky. I hope that some of the suggestions and tricks provided above will be of use for you, as they have been for others. I’d love to hear of any other tips, tricks, or tools you’ve got for feeding different foods in a multi-cat home. Please feel free to share them in the comments section below.